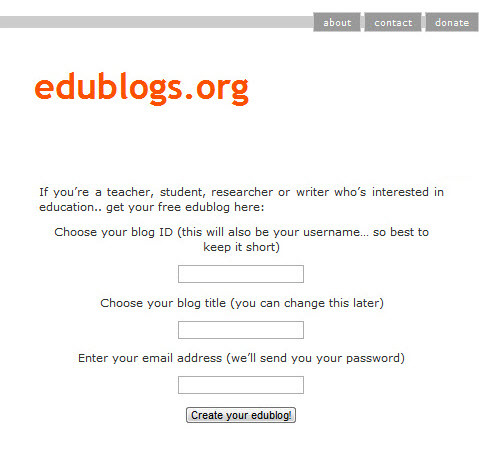 In August, Edublogs will be celebrating its tenth anniversary. We’ve been humbled by the user base we’ve amassed over the past decade, including five million blogs across our networks in nearly every country in the world, with almost 100 million unique visitors per month. Our first homepage was all kinds of awful. Along the way, we’ve learned lots about becoming a successful edtech business. And we’ve made our share of mistakes too. This post aims to share the top ten things we’ve learned, lessons that we hope will carry us into the next decade and beyond. Our fearless founder, James Farmer, knew early on that blogs could be transformative in education. He took some pretty big personal risks (like quitting his day job!) and grew the company into what it is today. You can learn more specifics about the beginnings of Edublogs in the post, How an English Lit Grad Bootstrapped a Successful WordPress Company. This advice isn’t new, but it’s important; it’s an experience just about all successful business ventures have in common. At several of the startup pitch competitions and conferences we’ve attended, we’ve noticed a large number of new companies pushing new ways of delivering content. Or perhaps they’ve put together curricula of their own. The work might be unique and even revolutionary, but creating content isn’t enough. Learning is about more than ‘sit and get’. Learning is about more than ‘sit and get’. Students must be true content creators and active participants in their own learning. Take a look at our first home page. It was all kinds of awful. But folks still signed up and gave us a try! It can be easy to get caught up in the details, which can ultimately slow you down. Don’t be afraid to throw out new features or services before they are perfect. You’ll be better for it in the long run. Make an effort to participate in conferences, attend edcamps, and take advantage of online communities in the education sphere. This doesn’t mean you need to be a pushy salesperson while doing so. Participate alongside active educators, just as if you too are in the classroom daily. Listen to their needs and feedback. Keep up with trends and best practices. Make connections, not customers. Our experience in the classroom has shown that it can take a teacher at least three experiences before truly feeling comfortable with a new lesson plan, web tool, or other new student activity. But in many cases, it can take three years before that third opportunity comes around. As a result, each time another edtech company fails, closes down, pivots or gets sold, teacher time is wasted and student learning is interrupted. Make sure that—with whatever service you offer—users can export or archive their work and take it with them should the unthinkable happen and you close up shop. This is what bothers us most about the current state of affairs in the edtech world; many seem to take for granted the time and valuable resources teachers commit when trying out the newest web tool or implementing the next big idea. To remedy this, make sure that—with whatever service you offer—users can export or archive their work and take it with them should the unthinkable happen and you close up shop. Make sure to frequently solicit feedback from your users in multiple ways. It is easy to send out a regular survey and collect a bunch of data. But don’t stop there. Make sure to carefully read each response and come up with improvement plans on an ongoing basis. You’d think that excellent support would be a no-brainer. But based on feedback from our users, good support is not commonplace with many edtech services. We get reports of customers going days waiting for replies to basic questions. Professional support should be a given, not an add-on. Additional resources like videos, user guides, handouts and parent letters also greatly improve the overall user experience. Professional support should be a given, not an add-on. Sue Waters, our support manager extraordinaire, was the very first full-time hire on the Edublogs team; that’s how much we value support. We know, we know. Edublogs started out as completely free (though we begged for donations) and we survived. Most edtech companies seem to start out this way too, especially those that are VC-backed. They get as many new users as possible for a year or two and then implement a paid tier. But if you can, don’t begin as purely free. Here is why. Slowly but surely, we are changing the culture within education, where “free” has historically been considered better. The reality is that when schools or teachers pay for a service, they become invested in seeing it succeed. And, of course, companies need revenue to stay in business. We are changing the culture within education, where “free” has historically been considered better. Edublogs does have a freemium model—with both free and paid services available. Our stats consistently tell us that if a teacher hasn’t upgraded to paid within the first 48 hours of using the service, there’s hardly any chance she ever will. But she may continue using the free version (and costing us money) indefinitely. If not free, what price? Many of us who have been educators can feel guilty about charging teachers and schools at all, so we often try to set fees as low as possible. We also may believe that the lowest price is the best way to grow a user base. In the long run, it is far better to have fewer customers paying more than many customers paying less. For example, we have had success concentrating our sales efforts on entire schools, districts, and universities. Over the past five years, ‘enterprise’ level revenue has swelled from 10% to 75% of our total income. There it is—the most important piece of advice that we’ve learned in the past decade. Remember that an edtech company is a very different animal than a consumer tech or other venture. Profit shouldn’t and can’t be the main goal. Edtech entrepreneurs will only be successful when they remember that every decision they make and every feature they build must somehow improve students’ education. Many thanks to all of the educators and students that we have learned from over the years. We look forward to the next decade of making global connections! Ronnie Burt is project manager for Edublogs and a former teacher. He's also a longhorn football obsessed native of the great state of Texas.